Some things were meant to be…Before becoming business partners in 2012, Leslie and Elle had successfully collaborated on a wide variety of staging projects. When the opportunity to purchase Refresh Home Staging came along, the ‘dynamic duo’ jumped at the chance to join forces and combine talents. It was a perfect match! Founded in 2007 by one of Vancouver’s premier stagers, Refresh Home Staging was already well-known for creating fresh, clean and welcoming styles in an ever-evolving industry. 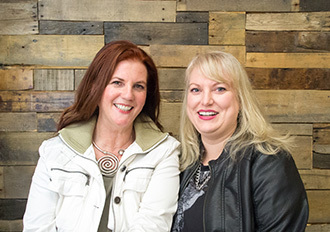 In addition to being Certified Redesign and Staging Specialists (CRSS), Leslie and Elle have been personally trained by renowned North American designer Matthew Finlason, award-winning host of HGTV’s series ‘The Stagers’. They are also active members of the Real Estate Staging Association and former Board Directors with the Canadian ReDesigners Association (CRDA). Bringing together her expertise in visual arts and visual merchandising, Staging Professional Leslie Todd has found her perfect niche in the Home Staging industry. Leslie grew up on the North Shore with mountains as her backdrop before moving to Vancouver to soak in the city’s vibrant arts & culture scene. Being at the hub of activity yet steps away from the seawall and park provides an ideal lifestyle. Leslie’s ability to strike the right balance between creativity and organization has been key throughout her career. From buyer for a local decor store to working as a floral designer, her people-focused approach has helped her establish lifelong clients. Leslie’s educational background in the colour and design field includes art history and fine arts—and a bit of travel thrown in for good measure! Award-winning Stager + Stylist Elle Hunter draws upon her wealth of business experience and creative talent to ensure Refresh Home Staging clients enjoy a rewarding and stress-free experience. Born and raised in cosmopolitan Montreal, she was drawn to the fashion industry early on. Her love of colour, fabric and the elements of design offered a seamless transition into Staging and Decor aesthetics. After visiting family in BC, she fell in love with Vancouver and set down roots. As an avid traveler, Elles’ passion for people and places has taken her around the world, sparking her creativity.